Radiohead are flogging a one-off remix of their song Videotape, remixed by James Rutledge and recorded onto a four-hour VHS tape. It's being auctioned on eBay to raise money for the charity Missing People. 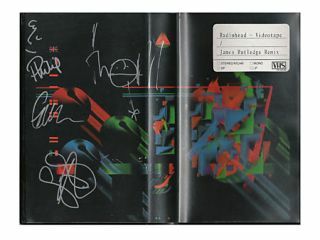 The tape's accompanying red, blue and green "disintegrating" visuals were designed by Philip M Lane while the matching artwork (fully signed by the band) was designed by Jacob Brandy. Expect a decent remix, too. James Rutledge has previously mashed-up the likes of Bloc Party, The Kills and - darlings of 2008 - MGMT.